Hell has officially frozen over, because I have a recipe to share (some of you may know that I am not that big on cooking, UNDERSTATEMENT ALERT). It's for a really, really good gazpacho. While I didn't actually create it myself, I think you should all be duly impressed that I have a recipe to share. So what if it's for a cold soup. 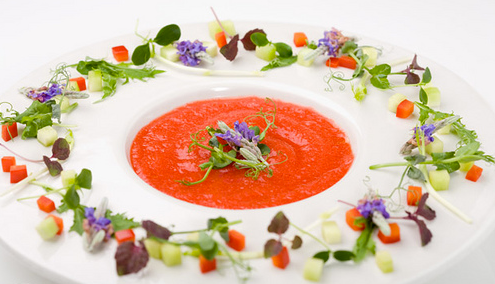 I've had gazpacho on the brain ever since a new Twitter pal, Danielle, asked what people's fave healthy foods are. I mentioned gazpacho, edamame, peaches and Hostess Snowballs, the pink kind, because as we all know they are chock full of vitamins and minerals and fiber and Omega-3s. Then today, I had lunch with my friend Erin (she blogs for Parenting, check out her posts!) and the waiter said the soup special was minestrone. "Do you have gazpacho?" I asked. They didn't, but we all agreed gazpacho rocks. I'm going to be making some over the weekend. The recipe is from a restaurant in Palm Beach whose name I can't recall. Dave and I had dinner there a few years ago when we were on vacation, and I was so wowed by the gazpacho I begged the waitress to get the chef to share the recipe. He did. Enjoy! So, what food are you obsessed with lately, healthy or not?! Combine diced cucumbers, green pepper, pimientos and onion in a large bowl with parsely, basil and garlic. Add tomatoes to soup along with the tomato juice; if using canned tomatoes, first strain the liquid from tomatoes. Hey Debbie Domestic! Seriously I am impressed. (I read your entry about the Ragu kitchen). This is just in time - its the first week in April, yesterday was 90 degrees (tonight's in the mfoggy forties) and Ive already planted my garden. This recipe is perfect - I planted heirloom tomatoes, zuchini and lots of herbs. I will share one of my tips. If you are a tea drinker you can make wonderful teas from dried fruits (cranberries, cherries, crystallized and fresh ginger,) and herbs like lemon balm and other mints. Even bee balm and raspberry, strawberry and blueberry leaves are saved and dried. I find the most economical place to buy dried fruits, nuts and cheeses in Massachusetts is Trader Joe's. Next to the Christmas Tree Shops (as my husband calls it "all the stuff you didn't know you didn't need", TJ's is my favorite place to shop. Hey Ellen, thanks for sharing this recipe...I'm always on the lookout for healthy easy recipe...I usually can't stand cold soup but I'll give this one a try! Totally making this this weekend - I love gazpacho! Nothing beats a cold soup on a hot summer day! Blend cucumber, red pepper, tomatoes, and/or other vegetables, 1/2 clove raw garlic, 1/2 slice bread (pre-soaked), salt, and a dash of sherry vinegar. Chill, and enjoy. That sounds good too, and even easier! The Italian dressing adds a certain tang to this that I found really appealing. Women on the Verge of a Nervous Breakdown is up there on my list of movies I really, really need to see! Now I have extra motivation! Unfortunately, I cannot agree with you on the borscht thing. I am anti-borscht, I have to admit! Barbara, thanks for being impressed with my so-called domesticity!!! Ha ha ha.....I hate beets, so I guess I'm anti-borscht, too! And as for food I am obsessed with - my sweet tooth has gone wild since I've had this baby. It was dangerous for me to read your previous post about the brownies. I am soooooo craving brownies now! Lucky it's late on a Saturday evening here and the shops are closed ;-). I made it today - YUMMY!!! I'm eager to try this! Speaking of learning how to make it in Spain, my husband is actually from there, and he makes a version that's quite different from what I think of as American gazpacho. It's extremely thin and people buy it in OJ-like cartons and drink it from cups there! Luckily he's willing to experience new tastes. Thanks for the recipe.